Some changes are going to be happening soon. A possible site redesign again, but there will be a rebranding of sorts happening without a doubt. The name and quality are staying the same, but there are some things that definitely need a face lift. 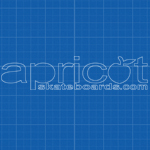 Apricot Skateboards is a company that specializes in making quality skateboard decks. Operated from South Florida, Apricot Skateboards is here to keep you on a board and having fun. Apricot Skateboards creates custom affordable decks. From beginners to the best, our prices will not leave you on the rail. Choose from our designs or work with our graphic designer to create your own. © 2019 Apricot Skateboards All Rights Reserved.